Australian Prime Minister Scott Morrison appeared at the leader's courtyard in Parliament House last Thursday to announce an election next month and proceeded to list the various reasons that he believed Australians should vote for him. He mentioned various policy areas, such as the economy, schools, hospitals and roads, but there was one issue he pointedly did not mention: climate change. When asked about this omission later in the day, he told Sky News: "Well, it's a very brief presentation you make at the start of an election." But Mr Morrison, who is a shrewd political operator, had good reasons not to have mentioned it. The first is that voters have a strong preference for the opposition Labor Party's climate policy over that of the ruling Liberal-National Coalition. Labor has committed to large-scale carbon emissions cuts and to ensuring that half of Australia's energy supply comes from renewable sources - and half of all new cars are electric - by 2030. In contrast, the Coalition has proposed much lower cuts and has no specific renewable target, but has proposed an A$2 billion (S$1.94 billion) fund to pay heavy polluters to reduce emissions. An Ipsos opinion survey published last Monday shows that 42 per cent of voters prefer Labor's climate policy and just 25 per cent prefer the Coalition's, with the remainder uncommitted. A separate Ipsos poll released on April 1 found that only 13 per cent of people thought the Coalition was doing a good job of addressing climate change. Labor to cut emissions by 45 per cent of 2005 levels by 2030; Coalition's target is 26 to 28 per cent. Labor aims for 50 per cent of electricity from renewables by 2030; Coalition has no target. Labor will not use carryover credits from the Kyoto Protocol period to meet targets; Coalition to use Kyoto credits. Labor to keep funding the global fund to help developing countries tackle climate change; Coalition to cease funding it. The other reason for Mr Morrison not labelling climate change among his top priorities is that the issue has proven deeply divisive within the Coalition. The Liberal Party has long been split between moderates and a conservative camp that is sceptical of climate change. This split led to the ousting last year of then Prime Minister Malcolm Turnbull, whose push for a new energy policy with emissions targets led to staunch opposition from some Liberal MPs. These divisions have not disappeared. Last Friday, for instance, former prime minister Tony Abbott, a staunch conservative who is fighting to retain his Sydney seat, indicated that he remained something of a climate change sceptic. "The so-called settled science is not quite as settled as people say," he told reporters. "We shouldn't... turn our economy upside down in what turns out to be a futile green gesture." Australia, a large island continent, is a nation at the forefront of the climate change issue and is facing severe threats of intense drought and bush fires due to warmer weather. Already, it has experienced record-breaking summers in recent years and the health of the Great Barrier Reef is in serious decline. Yet, the major political parties have struggled to overcome internal divisions and present a coherent approach to tackling climate change. This is despite Australia having one of the highest carbon emissions per capita, according to World Bank data. Professor Frank Jotzo, a climate policy expert from the Australian National University, said Australia is particularly susceptible to climate change and the lack of a clear policy has led to uncertainty for the business community. "Australia is more vulnerable than the majority of developed countries because of its geography, its climatic conditions and its economic structures," he told The Straits Times. "The business community is crying out for policy predictability on climate change." Ahead of the election on May 18, both parties have expressly adopted climate change policies - a development that Prof Jotzo noted is a welcome change. But he said the Coalition's plan is "thin", while Labor's is ambitious but lacks policy details, particularly when it comes to reducing heavy industry emissions. He also noted that Labor will probably be unable to achieve its 45 per cent emissions targets without lifting its renewable targets above 50 per cent. "Labor's target is hugely more ambitious," he said. "It is the right thing to do and will be an effective approach, if it is filled with significant ambition. The details are still open." In the past, Labor, like the Coalition, has come unstuck over climate change. Former Labor prime minister Julia Gillard was attacked savagely for reneging on a promise not to introduce a carbon tax. Her predecessor, Mr Kevin Rudd, strongly supported climate change action but eventually backed away from a plan for an emissions trading scheme, which was followed by a sharp drop in his approval ratings. For Australia, a united political front against climate change has proven elusive - and the fevered opening to the election campaign this week suggests it may again prove difficult after May 18. 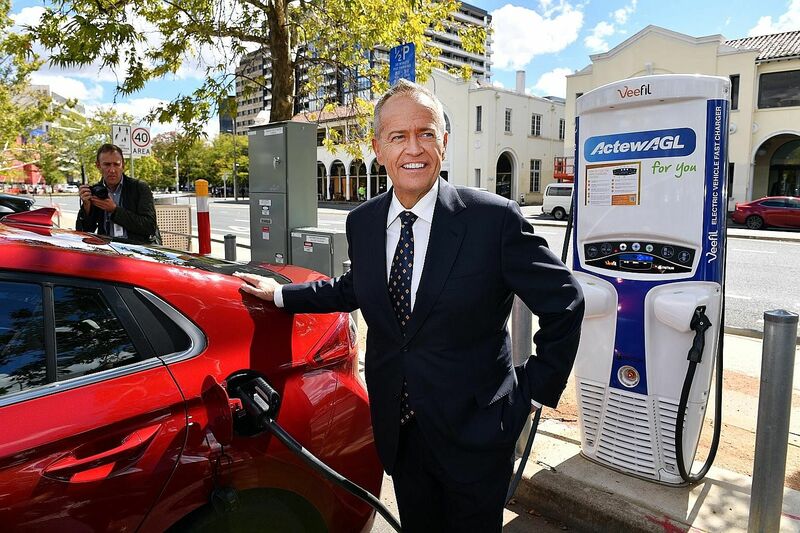 SYDNEY • When Labor leader Bill Shorten announced his climate plan earlier this month, the headline-grabbing item was a move to ensure that electric vehicles will make up half of all new car sales by 2030. The ambitious plan is intended to reduce pollution in the transport sector, which accounts for 19 per cent of the nation's emissions. Labor also wants to spend about A$100 million (S$97 million) on 200 new fast-charging stations. But the proposal came under heavy criticism from Prime Minister Scott Morrison, who claimed that people would no longer be able to afford four-wheel-drives and would be unable to "tow your boat" or go on camping holidays. "Bill Shorten wants to end the weekend," he said. "The cheapest (electric vehicle) you can currently buy... is about A$45,000 to A$50,000... I'll tell you what - it's not going to tow your trailer. It's not going to tow your boat." But Labor said the Liberal-National Coalition's own plan aims for electric cars to represent about 25 to 50 per cent of sales by 2030. Mr Shorten accused the Coalition of a desperate scare campaign, promising that he was not proposing to "confiscate" people's cars in 2030. "(The government) is so addicted to scare campaigns, they're even scaring you with their own policies," he said. Motoring organisations and some carmakers signalled support for the shift to electric vehicles, saying it would not remove choices for consumers and many current car models will soon be electric. Experts disputed claims that the power grid could not handle large-scale charging of the vehicles, particularly if cars were charged outside peak usage periods.